I sit today in this hot weather reminiscing the days of yonder. The cool crisp breeze that whisks nose, cheek and hands. There was freshness and a sense to liveliness in it which is unfathomable. This is the place where I spent a major part of my life. The hills form a valley within it nestled a cashew nut shaped lake formed by a glacier all around this is small hill resort called Nainital. The hills are dotted with trees slant roofed houses with varied colors. This adds to the beauty of the town. Mesmerized is me when I see the reflection of the town in the tranquil lake. I remember walking rather running up to school as we inevitability got engrossed in the activities that used to take place in the “flats” a large level ground at one end of the town . All major sporting and cultural activities took place here. This was also the meeting place for everyone. Since there was a temple of Naina Devi from where the name comes from Nainital the latter half of the word means lake. This area is also known as the Lake District. I fondly remember the ambling on the Mall road which almost all hill resorts in India have with my peers every evening after school. This used to be a regular affair which was adhered to each and every day come rain snow or sunshine. Here we used to run into most we knew in town. If we had put our heads and thoughts together we would end up knowing each and every one in the town. The population was meager in comparison of today. Infect everyone knew everyone. There was no prank, mischief, adventure, fight that would not be known to the other members of the family by the end of the day. One had to be very cautious all the time. One of us always did the watchman’s job. In the cold winter months the trees looked bare but all paths were covered by golden autumn leaves creating the cackling sound the moment you step on them the silence was shattered. The cold icy winter breeze bit your cheeks, nose at times it seems you had lost your nose it became so numb. Taking a bath was ordeal. I had mustered up enough courage for this 10 minute task without which you were not allowed to step out of the house. This has been a place for some well recognized schools in the country. The alumni’s of theses institution have been some of the very well known personalities of the country. This town was discovered by an Englishman Charles Barron more than 150 years back. Since then it has evolved into a busy city. Come to think of it I am saddened by this but the wheels of development cannot be stopped. The house were one of the foremost hunters of man eater leopards and Tiger’s Jim Corbett after whom the first Tiger reserve wildlife sanctuary has been set up lies in a depleted condition. The town is filled with hotels, restaurants and shops everywhere giving it a more commercial look. Than that of a hill resort which is quiet, serene, the pace of life is reduced to half. The freshness in the air seems adulterated today. The town is not the one that I lived in I feel alienated when I walk on the Mall road. The shopkeepers are not like they were, nor are the shops, the boatman’s perception has changed. Yet with all this I still love the town where I grew up. Those were and are the most wonderful years of my life till date. One song that always comes to mind “Country Road take me home “ by John Denver. I had been to your restaurant Ahar Vihar in 1995 and enjoyed your Gujarati food and still remember your company. 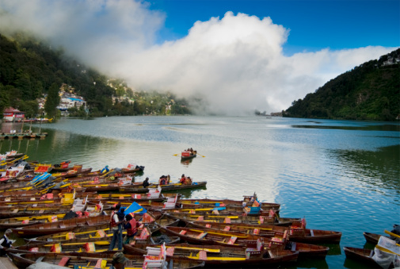 Again want to Visit Nainital in First week of June 2012and enjoy your company. Green green grass of home! Lovely blog.